Completed in August 2001, the Center is named in honor of Mary Kahrs Warnell, wife of Daniel B. Warnell and mother of five children, including sisters Dorothy Warnell, who died in 1996, and Carolyn Warnell Bryan, who deeded the land for both the forest and the Center. The Center was dedicated on 7 November 2001. Daniel Brooks Warnell was born to Asa Winfield Warnell and Mary Jane Edwards Warnell on 30 October 1881 in Groveland, Georgia. He was married to Mary Alice "Mamie" Kahrs Warnell on his birthday in 1907. Daniel and Mary had 5 children: Harold Brooks Warnell, William Alvin Warnell, Anna Dorothy Warnell, Carolyn Adel Warnell (Bryan) and Charles Frederick Warnell. The Warnell family lived in Groveland, Georgia until 1927 when they moved to Pembroke, Georgia. 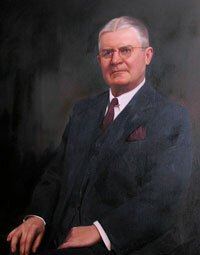 Daniel was President of the Pembroke National Bank from 1935 until his death in 1945. He served as Bryan County Commissioner from 1924-1925, was a State Representative for the Georgia House of Representatives from 1931-1937, and was a Georgia State Senator from 1937-1939. He was also a trustee of the Pembroke School District from 1923-1937 and served as Chairman for the Pembroke School District from 1925-1937. From the early age of 10, Daniel was highly involved in the naval stores production business in south Georgia. He was well established in the industry the year he was married, 1907, and by 1915, he was the "most prominent naval stores producer in Bryan County…[and] with the exception of Henry Ford, Warnell was the largest employer in Bryan County during the 1920s and 1930s (Sullivan 2000)." You can still see trees that bear the trademark 'catfaces' of turpentine production on the Dorothy Warnell Research, Education and Demonstration Forest. Perhaps Daniel's greatest contribution to the timber industry was not his involvement in the naval stores industry, but that of a gift of pine trees to a researcher named Charles Herty. In 1933, Daniel Warnell supplied southern yellow pine trees to Dr. Herty for an experiment on whether pine could be used in the manufacturing of paper pulp and the rest, as they say, is history. Mary Alice "Mamie" Kahrs Warnell was born on 11 March 1880 to John Henry Kahrs and Anna Louisa Faulbeir Kahrs in Charleston, South Carolina. Upon her marriage to Daniel Brooks Warnell on 30 October 1907, Mary left the modern comforts and conveniences of Charleston to move to rural Bryan County, Georgia. Mary was a devoted wife and mother of five children: Harold Brooks Warnell, William Alvin Warnell, Anna Dorothy Warnell, Carolyn Adel Warnell (Bryan) and Charles Frederick Warnell. "As a wife and mother, my grandmother is remembered as a lady of grace and dignity. She was warm, affectionate, generous, full of kind deeds, a great source of strength, Holy in character, and of strong moral worth." If you would like to learn more about the Warnell family or the turpentine industry in south Georgia, both books are on display at the Mary Kahrs Warnell Forest Education Center. The books were donated to the Mary Kahrs Warnell Forest Education Center on 7 November 2001 by the children and grandchildren of Mr. and Mrs. Charles F. Warnell, Sr.